It was an honor to return as a guest judge and lecturer at Game Worlds Camp this past summer to talk about creative strategies for environment design and concept art. Students learn how to craft their own fully functioning video games while collaborating in teams. It's a wonderful program. Thanks to founder Alicia Andrew for having me back! 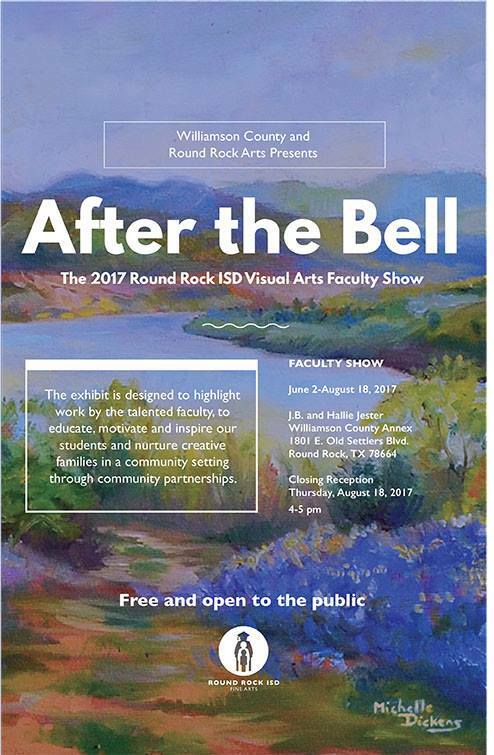 My oil painting, 'Bluebonnets at Turkey Bend' is featured on the promotional poster for the RRISD faculty art show! The exhibit runs from June 2nd-August 18th at the Jester Williamson County Annex in Round Rock. Please visit! I'm thrilled to announce that I've been named as one of the judges for the 2016 Texas Women In Games Conference Art Showcase competition! The conference takes place at the State Capitol on Saturday, February 20th from 12-6pm, and includes great panels, networking opportunities, and achievement awards. I spent an early morning last weekend painting this vintage gas station out in the quiet little town of Driftwood, TX. While observing the structure and all its quaint details, it felt as though I were transported to another era. I thought it was pretty neat how well preserved the station was. To see more plein air paintings, click here. Copyright © 2015 Michelle Dickens. I recently had the honor of giving a presentation at the AAUGA monthly meeting, where I demonstrated the painting process of this environment concept piece. Along the way I covered topics of lighting, value, atmospheric perspective, form, and artistic inspirations of mine. Thanks to all who were able to attend, and to the AAUGA for inviting me back as a speaker and being so accommodating as always! Last week at Game Worlds Camp, I was invited to give a lecture on production art and return as a guest judge for the student's game projects. I was absolutely amazed by the work the kids created together in teams at the end of the week. Thanks to Game Worlds founder Alicia Andrew for having me! It was a beautiful morning at Mayfield Park while painting this piece. It's been an extraordinarily rainy month in Texas, and as a result it's been challenging to find breaks in the stormy weather to go plein air painting. The precipitation held off just enough to capture this scene; I felt that the somberness of the grey afternoon was echoed perfectly by these two lonely old trees. "A Drizzly Afternoon" Plein Air. Oil on canvas, 8" x 10." Copyright 2015 Michelle Dickens. Hello and welcome to my blog page, where I will be making periodic updates with news and artwork. Stay tuned!